Custer started fourth, finished third. Earned eight bonus points. Custer piloted the Haas Automation Ford to the second position by lap two. During the stage, he noted visibility and handling issues due to sand on the windshield and tight-handling conditions. After a lap-33 caution, the stage concluded under caution. He pitted for four tires, fuel and chassis adjustments. Custer started third, finished sixth. Earned five bonus points. Custer fell to the sixth position during the restart, but battled back to third place on lap 48. On lap 69, the caution flag was raised due to a cut tire on the No. 42 car, ultimately ending Stage 2 under caution. He pitted for four tires, fuel and adjustments, and gained one position on pit road. Custer started fifth, finished sixth. 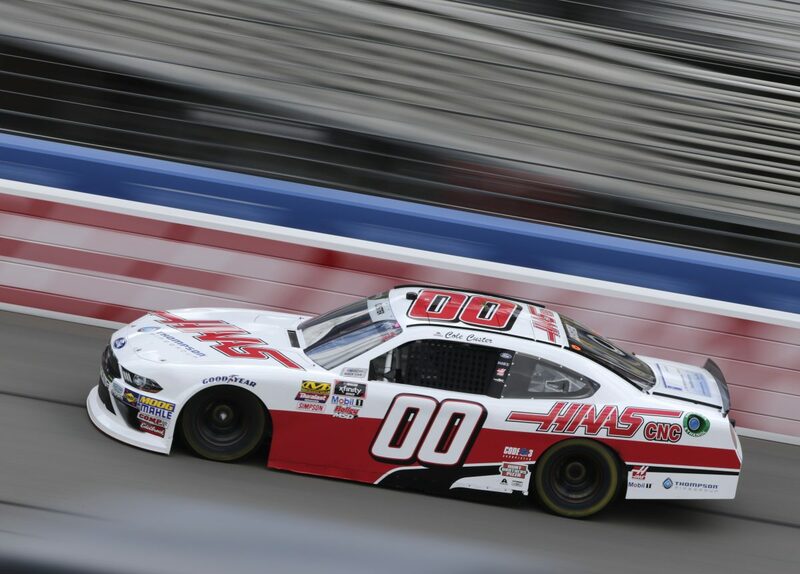 Custer piloted his Haas Automation Ford Mustang in and around the top-five until a lap-96 caution. During the caution, crew chief Jeff Meendering radioed Custer to the pits for four tires, fuel and chassis adjustments. Custer climbed to as high as second and ran inside the top-10 before another caution on lap 139. He pitted for four tires and fuel. Custer restarted in the third position behind a car on older tires. As a result, he was caught in traffic and battled just outside of the top-five before the conclusion of the race. This was Custer’s second NASCAR Xfinity Series race at Auto Club Speedway. This marks Custer’s first top-10 at Auto Club and third top-10 of the season. This was Custer’s third straight top-10. Custer earned 13 bonus points in the Roseanne 300. Only 22 of the 40 drivers finished on the lead lap. Seven cautions slowed the race for 32 laps. Joey Logano won the Roseanne 300 to score his 29th career Xfinity Series victory, first of the season and third at Auto Club Speedway. His margin of victory over second-place Justin Allgaier was 1.429 seconds.